This Christmas Candy Cane Cookies recipe is a family-favorite cookie that creates sweet holiday memories. Made from a simple cookie dough recipe, with plenty of festive peppermint flavor, the colorful dough is twisted to look like a real candy cane. Always a favorite at Christmas parties and cookie exchanges. 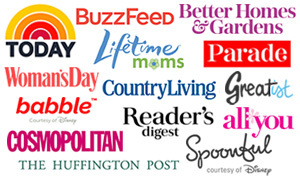 This post is brought to you in partnership with REAL® Seal & contains some affiliate links for your convenience. Click here to read our full disclosure policy. When I was little, there were only two cookies that I vividly remember my mom making for Christmas. One was Russian Teacakes and while I certainly didn’t turn them down, they weren’t my favorite. But there was one cookie that my mom made for Christmas that I loved: Candy Cane Cookies. I’ve talked with other people about Candy Cane Cookies over the years. A lot of times, they will me how they made them with their mom for Christmas and, because of that, the cookies always held a special place in their heart. 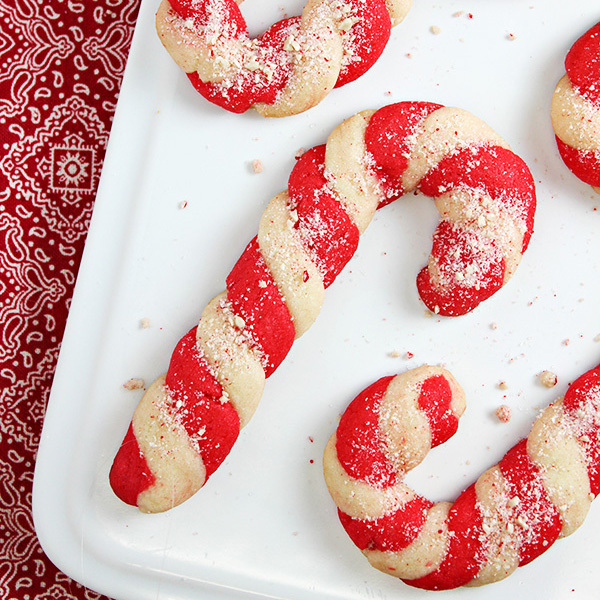 Candy Cane Cookies always seem to be one of the top memory-making Christmas cookies. But, making candy cane cookies side-by-side with my mother, wasn’t my memory. I don’t recall ever helping my mom make them. I’m not sure if she never thought to have us help, of if she preferred to do it herself, or maybe us kids didn’t want to help, but it wasn’t something I made with my mom. But while that might seem a bit sad, it’s totally not. Because my memory is that when my mom made those cookies, she was a superstar baker. I didn’t understand how my mom could transform a candy cane into a delightfully sweet cookie. How did she make the two colors? How did she make it all twisted together? Just how did she do it? I asked her. I always asked a lot of questions. But she didn’t give me all her secrets and so the magic remained. At some point, my mom stopped making Candy Cane Cookies. But her times of making them were enough to seal a memory in my mind. Eventually, when I was a young wife and mom, I made those Candy Cane Cookies for my kids. I’m not sure my kids are as impressed with mine, as I was with my mom’s, but I know they love them and I know that they eat them almost as fast as I can make them. And that’s good enough. 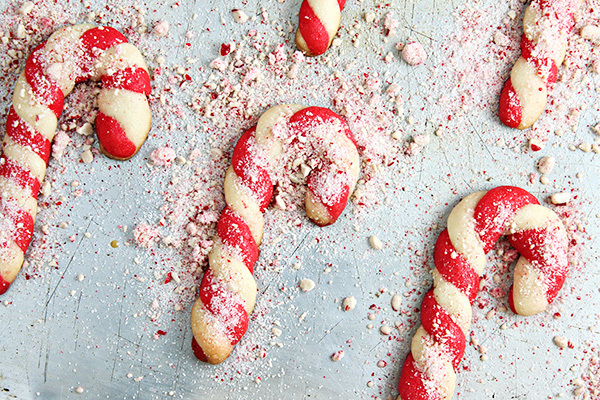 You’ll be relieved to know that Candy Cane Cookies are actually quite easy to make. No magic is needed and you don’t have to have superpowers. The dough is a simple sugar dough, which is divided in half. Half is tinted with red food coloring gel. To make a Candy Cane Cookie, you take 1 teaspoon of each color and roll each color out into a “rope” that is about 5″ long. You’ll find that many Candy Cane Cookie recipes will tell you to make the ropes 4″ long. I like the 5″ long because I prefer a more slender candy cane look. The two rope colors are twisted together and then placed on a baking sheet, curving the top to one side so that it forms the look of a candy cane. The cookies are baked in the oven, giving you just enough time to create a mixture of sugar and crushed peppermint candies. This is what is sprinkled on top of the cookies immediately after coming out of the oven. I recommend that you don’t skip this step – it really makes them quite pretty and even more delicious. Once you’ve added the peppermint sprinkle on top, your Christmas Candy Cane Cookies are done and ready to be enjoyed! When buying ingredients for these Candy Cane Cookies and your other holiday cookies, be sure to look for the REAL® Seal on your butter. When you see the REAL® Seal on a product (which can be on the front, back, or side of the product), it’s a sign that the product you are buying is a genuine dairy product, made with milk from cows on U.S. dairy farms. You can learn more on the REAL® Seal website. In a large bowl, beat together butter, both sugars, both extracts, and egg on low, just until combined. Stir in flour, baking powder, and salt. Divide dough in half, making sure you have 2 equal portions. Add red food coloring gel to half of the dough until the desired color is reached. Wrap each portion of dough in plastic wrap and refrigerated for 3-4 hours. In a small bowl, combine peppermint candy and 2 tablespoons sugar. Set aside. 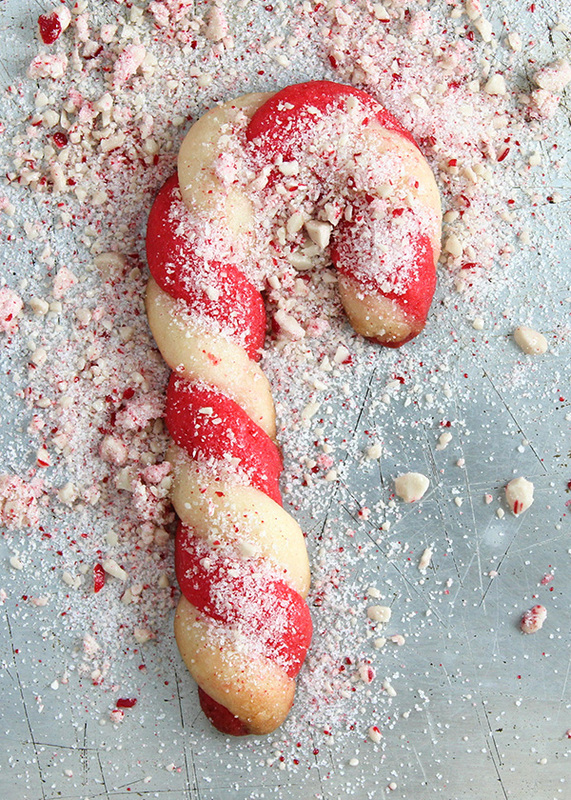 To make a candy cane cookie, take 1 level teaspoon of each dough. Roll each teaspoon into a 5″ rope (use a ruler, if necessary). Place one red and one white rope next to each other and begin twisting the two colors together, while pressing ends together so that they won’t unravel. Place on an ungreased baking sheet, curving the top to one side to form the look of a candy cane. Bake for 8-10 minutes or until lightly browned. Immediately sprinkle cookies with the sugar/peppermint mixture. Move cookies to a wire rack to finish cooling. 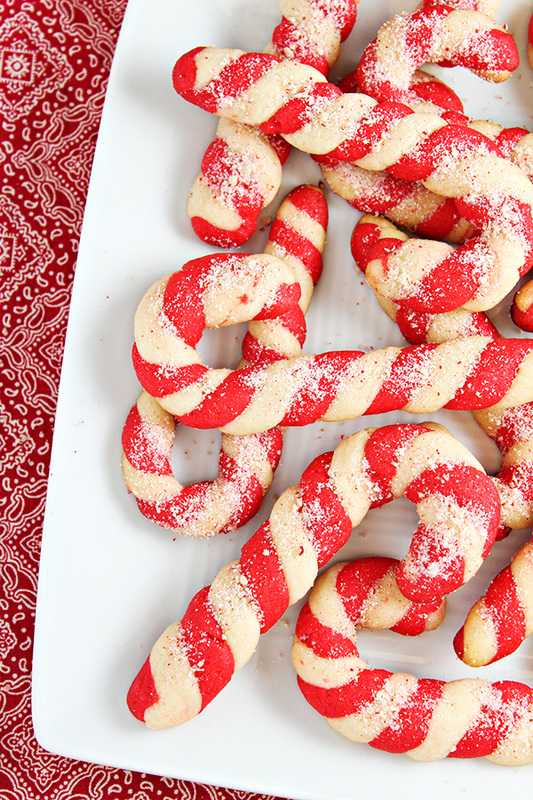 This Candy Cane Cookies recipe is a family-favorite cookie that creates sweet holiday memories. Always a favorite at Christmas parties and cookie exchanges. Place on an ungreased baking sheet, curving the top to one side to form the look of a candy cane. Bake for 8-10 minutes or until lightly browned. Immediately sprinkle cookies with the sugar/peppermint mixture. Movie cookies to a wire rack to finish cooling. 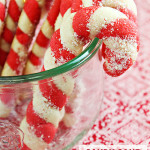 I’d love to hear if you have Christmas Candy Cane Cookie memories – did someone in your family make them? Have you ever made them for your family? I made these for Christmas and they were a huge hit. Everyone loved them – definitely going on my annual to-make list! Thanks for sharing these at the Craftastic Monday Link Party. I have a relative who is not fond of almond extract… if I omit it, should I add extra vanilla extract? Meant to say “peppermint extract” instead of “almond extract.” Sorry. Yes, you can substitute vanilla extract. The cookies won’t have the peppermint flavor, of course, but it’s an option if someone doesn’t like it. This looks great – haven’t made them yet… can you make the dough then refrigerate until the following day, before shaping and baking? I’m planning on doing some Christmas baking with my toddler but the 3-4 hours in the fridge would make it a bit tight to get it done all in one day. I made these last year and they were perfect, other than the fact that they weren’t very sweet at all. It was more like peppermint dough. What did I did wrong?? My mom made the Betty Crocker Candy Cane cookies. I’ll have to try your version. I don’t like to spend the time twisting the candy canes so I roll the dough out and cut with cookie cutters or make the dough into a log, chill it and then slice. This was a tradition in our family,my mom made these every year.Still make them for my family every yr.I have passed this on to my daughters,it’s not Christmas without them. Great and easy to follow directions – and love the cookies! Thanks for sharing at the What’s for Dinner party! Would I be able to bake these then freeze them for about a week or two before consuming? I haven’t personally tried freezing them, but I do imagine that they would freeze well. If you try it, let us know how it works for you. Hi, these cookies are so good but mine came out flat and not round like yours look. what did I do wrong or how do you make them round? It’s hard to say for sure, but make sure the dough isn’t too soft (or warm) before you start rolling the ropes. If the dough is too soft, try refrigerating it for about 30-45 minutes. If the dough is too warm or too soft, it can result in flat cookies. I found that adding some cream of tarter with the flour helps them puff up more. Hi! My mom and I are currently making these for the first time. We were wondering when do you use the vanilla extract? Both extracts are added at the same time (with the butter & sugars). I’ve made it more clear in the instructions. Happy Baking! Hello! I am making these for a cookie exchange this year and I have a question about the recipe. When do you use the powdered sugar? Thanks for asking – I can see where that wasn’t clear. It’s added when creaming the butter (with the granulated sugar). I’ve edited the recipe. About how many cookies should the recipe make? I’m going to make them for my annual cookie exchange party! This recipe makes about 3 1/2 – 4 dozen cookies. These are just gorgeous! Thanks for linkin’ up with What’s Cookin’ Wednesday! These cookies are adorable and sound delicious! Thanks for the recipe. I host my family Christmas party of 60 people every year and I’m going to put these on the menu this year! I remember a friends mom made these. I’ve never made them but maybe I should try it this year. My kids would love those pretty cookies. Not only do they sound delicious – they look delicious AND fun! Thanks for sharing on the What’s for Dinner Link up! 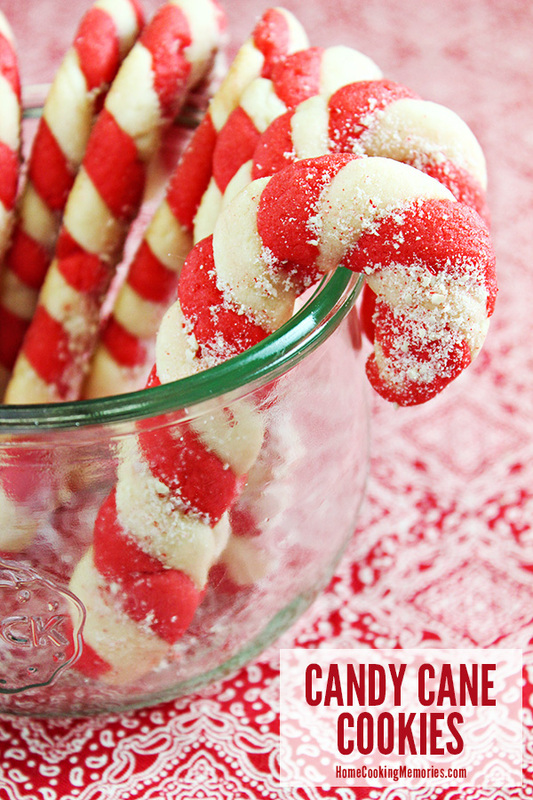 Planning on making these Candy Cane cookies for a Christmas cookie exchange. How many cookies would you get making this recipe? This recipe makes about 3 1/2 – 4 dozen cookies. Enjoy!